Heat gas or charcoal grill. Reserve 2 teaspoons taco seasoning mix for topping. In small bowl, combine remaining taco seasoning mix, 1 tablespoon of the lime juice and the honey; mix well. Brush mixture on both sides of each pork chop. Discard any remaining mixture. When grill is heated, place pork chops on gas grill over medium heat or on charcoal grill 4 to 6 inches from medium coals. Cook covered 8 to 10 minutes or until pork is slightly pink in center, turning once or twice. Meanwhile, in small bowl, combine avocado, reserved 2 teaspoons taco seasoning mix and remaining 1 tablespoon lime juice; mash with fork until almost smooth. 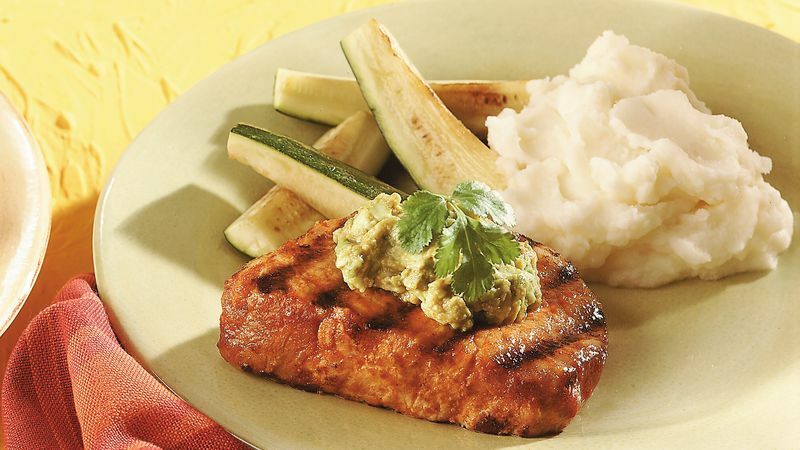 Serve pork chops topped with avocado mixture. Sprinkle with cilantro. Use a disposable plate or waxed paper when you prepare the pork chops for the grill. Then, for food safety, be sure to use a clean plate to serve the chops. Broiled Taco Pork Chops: Place pork chops on broiler pan; broil 4 to 6 inches from heat using times above as a guide, turning once or twice.